To work on third grade geometry and measurement standards, click on the numbers below to visit pages with internet resources for each of the learning standards on the right. 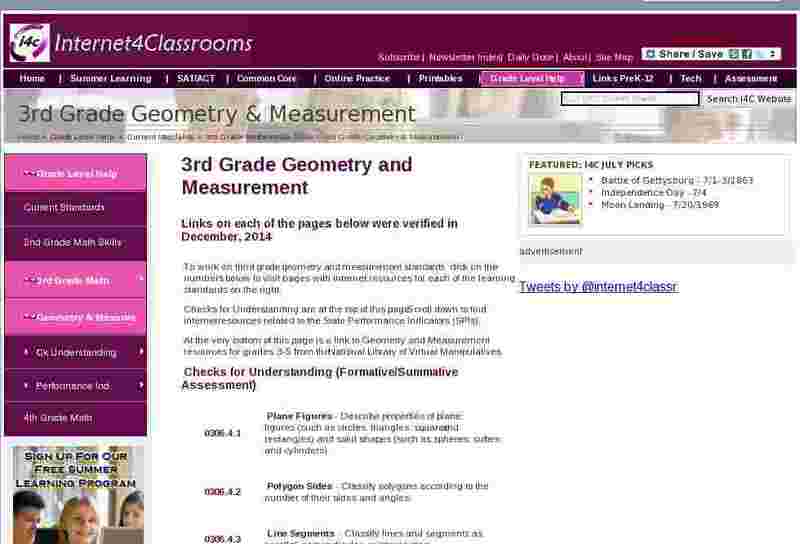 At the very bottom of this page is a link to Geometry and Measurement resources for grades 3-5 from the National Library of Virtual Manipulatives. Plane	Figures	- Describe properties of plane figures (such as circles, triangles, squares and rectangles) and solid shapes (such as spheres, cubes and cylinders). Polygon	Sides	- Classify polygons according to the number of their sides and angles. Line	Segments	- Classify lines and segments as parallel, perpendicular, or intersecting. Measurement	Units	- Understand that all measurements require units. Fractions	- Recognize the use of fractions in liquid measures. Relationships	- Recognize the relationships among cups, pints, quarts, and gallons. 0306.4.8 Capacity - Estimate and/or measure the capacity of a container. 0306.4.9 Weight - Measure weight to the nearest ounce or gram. 0306.4.10 Estimates - Use reasonable units of length (i.e. kilometer, meter, centimeter; mile, yard, foot, inch) in estimates and measures. 0306.4.11 Equivalences - Know common equivalences for length (1 meter = 100 centimeters, 1 yard = 3 feet, 1 foot = 12 inches). 0306.4.12 Mixed Units - Make and record measurements that use mixed units within the same system of measurement (such as feet and inches, meters and centimeters). Abbreviations	- Use common abbreviations: km, m, cm, in, ft, yd, mi. Polygons	- Recognize polygons and be able to identify examples based on geometric definitions. Congruent	- Determine if two figures are congruent based on size and shape. Symmetry	- Identify the line of symmetry in a two-dimensional design or shape. SPI 0306.4.4 Perimeter - Calculate the perimeter of shapes made from polygons. SPI 0306.4.5 Estimate Measure - Choose reasonable units of measure, estimate common measurements using benchmarks, and use appropriate tools to make measurements. SPI 0306.4.6 Measure Length - Measure length to the nearest centimeter or half inch. Length	Problems	- Solve problems requiring the addition and subtraction of lengths. Geometry	- for Grades 3 through 5.